As the age of two approached, my son certainly began to demonstrate his own particular interests. 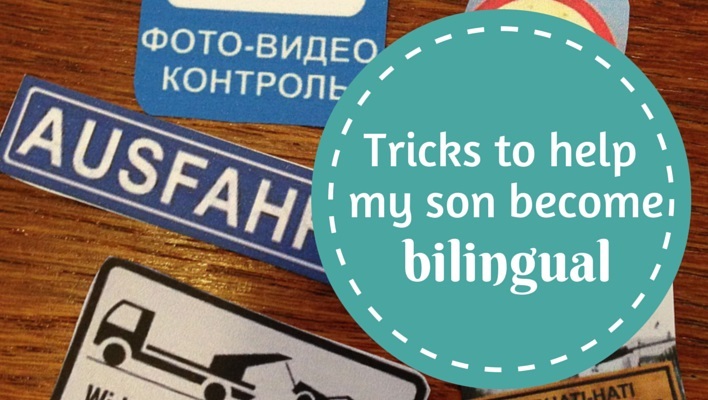 Choosing the German baby books to read him was a bit random, but as he became a toddler the kinds of books and topics he was interested in became more specific to him. 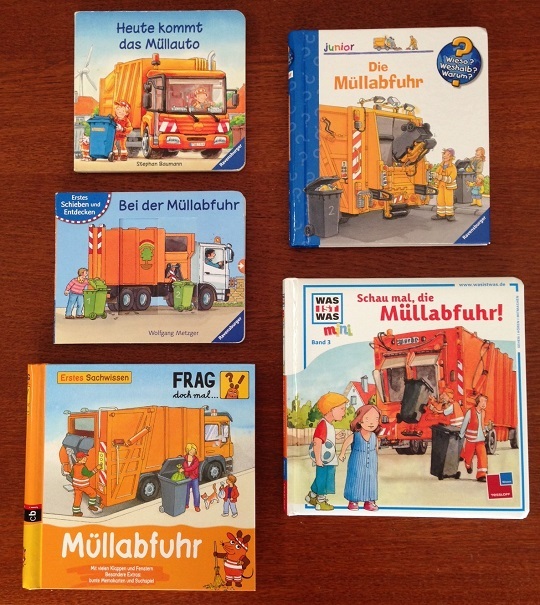 So if you have a son (or daughter, even) with a particular interest in rubbish or garbage trucks, then you will be especially keen on this list – but there are some other good suggestions for German children’s books for toddlers too, I promise! I found with my son around the ages of two and three that there’d be times when he was more keen on shorter books and times when his concentration span and interest was much longer. We still used a lot of the German baby books he loved and then added on some longer books. We love Conni – the German girl in a billion German books! I actually can’t remember how I first discovered Conni, but she has been a firm fixture in our house ever since I did. She’s a slightly tomboy-ish girl and the topics of the books generally suit both boys and girls, and my son has certainly never been bothered by the fact that she’s a girl (there is a sort-of-equivalent series about a boy named Max but Conni is the original and best!). 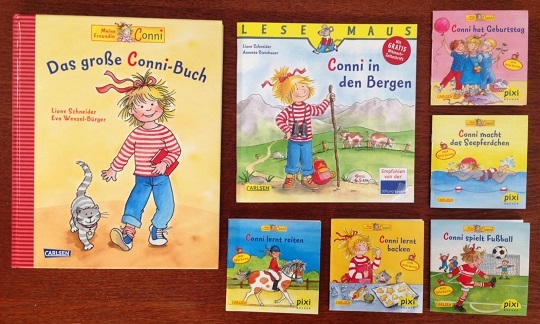 The Conni German books are a great length, longer than a baby book but not as long as a book for older kids. They’re usually about everyday kind of events – in some of the books you can see here Conni learns to bake, plays football, visits the mountains, learns to swim and celebrates her birthday. There are lots of colourful illustrations and just the right amount of text on each page. They are fairly factual and not exactly imaginative (a recurring theme here right?) but my son loves them, and my husband and son love to read them together as well. They also come in those tiny versions (same book just quite small print – great for travelling!) and the larger size, and recently we got a big Conni book as well. There’s also a TV series – wait for my DVD post and you’ll find out more! The TV show has the catch-cry “alle lieben Conni” – everyone loves Conni – and I have to admit that I really like her too – she’s definitely not an annoying character! German books for children … about rubbish and garbage! Long-time blog readers will know that my son has a keen interest in rubbish trucks and garbage bins. (Don’t ask me where that came from … it’s just his thing!) You might be surprised just how many German kids books are written about garbage, which just goes to show that my son is not the only one with such an interest, I suppose. Just part of our collection of German books for toddlers about garbage and rubbish! Welche Farbe Ist Das? – what colour is that? There are dozens more – just click through one of them and Amazon will probably automatically show you some more. On one of our visits to the lovely bookshop of Pfullendorf (my favourite bookshop in Germany because we always get a chance to visit there, near my mother-in-law’s apartment), we picked up a couple of longer German stories for kids that we thought our son would like. By total coincidence (or is it??) both these books are by Swedish authors! 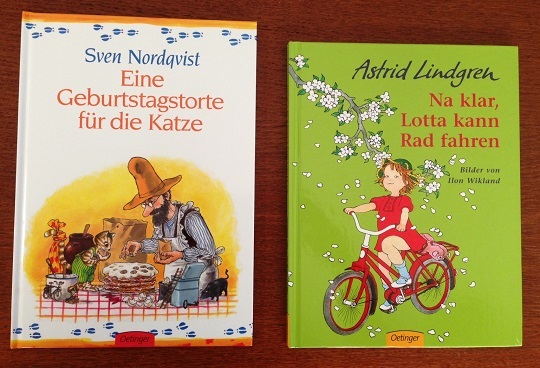 Astrid Lindgren is, of course, well-known to us English-speakers as well as the author of Pippi Longstocking, and she has also written a gorgeous series of books about the kids on Krachmacherstrasse – like Na klar, Lotta kann Rad fahren (“Of course Lotta can ride a bike”). We also stumbled upon the gorgeous characters of Pettersson und Findus (a man and his clever talking cat) by Sven Nordqvist, and this one, Eine Geburtstagstorte für die Katze (“A birthday cake for the cat”) is a fun story – one of many more (and we now have a DVD too – more on that in a later post). These are beautifully illustrated with plenty of pictures but quite a lot of text on some pages so they are borderline toddler books, I think. I have to say I was pleasantly surprised at how happy my son was to continue listening to German children’s books. He began to talk (mostly in English) quite early and was very articulate, so he could easily have complained but didn’t: and although he didn’t like to talk that much in German, at this age he never objected to listening to children’s books in German and seemed to understand them equally as well as he understood English books. I guess this is at least partly because we had always read him German kids’ books (as well as English – probably about half and half though as we began to visit the library more often, there was more English than German) and partly because we managed to find some German books he really loved. As always – if you have some great suggestions for German books for toddlers, please add them in the comments below – thanks!